We are a 501(c)(3) non-profit organization providing meals, clothing, and shelter to America’s most needy Veterans and their families. 100% of all charitable donations go back to our Veterans. We are a group of Veterans and civilian volunteers working together to help needy Veterans and their families. We are the conduit between individual and corporate donors and those in need of services and support. We sponsor and participate in numerous events throughout the year to benefit Veterans, through both fundraising and awareness. From dinner banquets to our annual motorcycle run, there’s something for everyone. Join us! We offer many ways for you to support Disabled and Limbless Veterans, our Veterans, and their families: become a member, get a specialized Supporting Our Troops license plate, become a sponsor, make a donation, and more. Our major campaign is the purchase of a facility to be operated as a transition house for the neediest veterans. Your donations can accelerate this campaign and help us provide much needed aid more quickly. 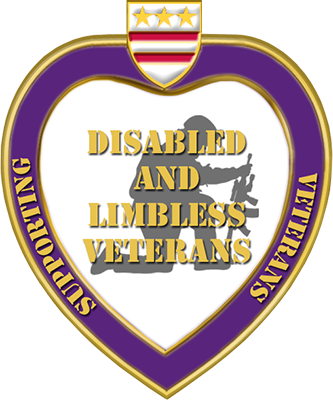 Disabled and Limbless Veterans Inc. is a 501(c)(3) non-profit organization providing meals, clothing, and shelter to America’s most needy Veterans and their families.